At some point in our lives, there may be reason to live in a larger home. For some, that time is only temporary and it just makes sense to downsize after all the kids have moved out and established homes of their own. Today, we are seeing an unprecedented number of families downsizing their living space, finding it a necessary and beneficial step in a downturned economy. A smaller home equals lower utility bills, but it can also mean fewer areas in which to display knick-knacks or house large pieces of furniture. Moving, in any instance, can be a stressful event. Even when you are looking forward to a potential downsize, its effects aren't often immediately felt. Once you have lived in a more spacious home, a smaller abode can take some adjustment. Getting rid of much-loved, often-used furniture can seem unheard of, and unnecessary, and in most cases, this is true. Determining just how existing furniture and appliances will fit into a new, more compact environment is also difficult to determine unless you measure every room. Furthermore, when you move because you want to save money, the idea of buying all new furniture for this new home doesn't make sense. Downsizing, whether the move will be done by professional movers, or on your own, can be approached in a few ways. You could spend a few weekends gathering up all of those items that fill your larger home and move them to the garage. The next few weekends will then be spent holding garage sales until most of your furnishings, toys, and household goods have become someone else's treasures. What's left - clothing, gardening supplies, furniture and fixtures, could be given away to charity so that you are freed from the obligation to move these unused items. While these steps might be beneficial, they also might prove to be difficult when you do not know exactly what will fit in your new home. Another option for downsizing without additional stress is to procure storage. Self storage can be found with units ranging in size and amenities. 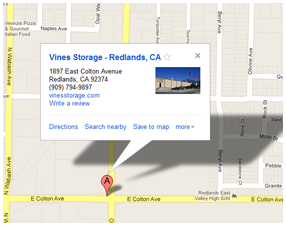 Our Redlands, CA facility safely and effectively holds everything from grandma's sofa to seasonal clothing to those boxes of family photos you've yet to put into albums. By placing those items you aren't ready to part with into a storage unit, you save yourself the hassle of moving them into a too-small home, and allow yourself time to pick and choose those items you really do not need. Come visit our self storage units, and see for yourself how easy downsizing can be.